Dubbed the "solar-power generating tree that bears two fruits – green power for public areas and a treat for the eyes" the Solarflora design is taking center stage. 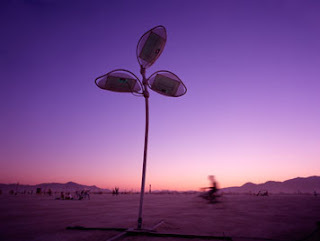 The Long Beach California company launched the product in the fall of 2010 and has been taking this solar powered flower on tour around the country. From their website: "An engaging and elegant sculpture intended for use at public squares and parks of all kinds, outdoor malls, museums, festivals, business complexes, universities, and sidewalks, the Solarflora houses up to four solar panels and can supply as much as 750 watt-hours per day, powering evening park lighting, on-site offices, street lamps, and charging stations for electric bicycles and other small vehicles. Made in Long Beach, California from locally produced materials, this highly original combination of environmentally friendly technology and public-space friendly artwork is creating new solar power enthusiasts of all ages and profess﻿ions..."